She would be the perfect neighbor because she is so generous. In addition to taking wonderful care of her family, she is there for her real-world and blogger-world friends. The recipes she shares are so helpful. I especially enjoyed the post about her housewarming basket with the reasons given for why to include each gift. She gardens to provide food for her family. She overgrows some foods and gladly gives her surplus away. She inspires me to work on my goal of downsizing and to be happy with what I have. I think her blog is lovely and cool . . . and we’re both mothers to sweet little redheads. I love the voice she writes in. It’s smart and funny with just a touch of self-deprecation. I think she’d be fun to sit down and chat with. We’re both organizing-loving-mamas. She has a lot of creative ideas and I think we would have fun cleaning out somebody’s closet together! I would like to look at her doily collection, paint with her, and I think we could laugh a lot together, too! She’s devoted to her family, health, and passions. I think she would be a great inspiration to me, and our kids could play together! I love her blog, her ideas are cute, her themes are interesting and her writing style is great. As a fellow organizer, I think she and I would have a lot in common. My home looks so much prettier because of the things I read in her blog. Imagine how it would look if she lived next door! I would pick her as a neighbor because I know we could have some really good discussions about life and what it really means to live and be happy. She is upbeat, looks for the best in herself and others, and just makes you feel all warm and fuzzy inside. I wait for her blog every day. It brings a smile to my face without fail. She can do it all! Maybe if she lived next door, she would rub off on me! She shares her life with us on a regular basis. She is a loving mother and talented cook who takes pride in gardening and making it last until next growing season. I have learned a lot about canning and comfort food from her! She is very talented and loves to shop at Goodwill, like me, and turn her finds into treasures. I enjoy her posts about projects as well as redoing rooms in her house. I want to craft with her!!!!!!!!!!!!!!! I’m hooked on reading all her yummy recipes! I’ve learned how to refashion . . . or at least try to! If she lived next door, I could get good advice on my projects every day. And I love her photos! She has taught me that age doesn’t matter, location doesn’t matter . . . what matters is that we’re all women and in it together. She’s a long, long way from home, but she’s making a home where she is. Her home! Her clothes! Her recipes! Her humor! She weaves her faith in God into her everyday life. That inspires me! She is SO gracious and SO talented . . . and her craft room is to die for! I’d learn how to dress like a million dollars on my small budget if she lived next door. How could anyone not want a neighbor with such a quirky sense of humor! She can do everything! Inside and out! And she’s fun and funny. I’d love to be able to run next door and see what she’s up to. She has a fine-tuned sense of taste. I posted a project I had worked on and how I struggled with it, and she shared a post that she had written about creating the same project. She shares her faith in her blog, which I admire, and how it keeps her going even when her health makes it hard to blog. I know I’m going to laugh . . . AND be inspired . . . when I see one of her posts in the WordPress reader. She is a true blue humanitarian. I want to be like her. Her recipes . . . crafts . . . kids’ party ideas . . . need I say more??? Her blog helps promote her business . . . but in a very non-in-your-face kind of way. Readers feel welcome to try her ideas whether they’re customers or not. This blogger makes me feel like I really can make my dream of becoming a published author come true. Have you seen the awesome style this designer has? Her place is gorgeous! I want her to live next door so that we can decorate together, go hunting for bargains and great finds together, and so our fur-babies can be best friends! She was one of my very first visitors and has remained a frequent visitor and commenter. That’s special! Add to that the wonderful creativity and humanity she embodies, as well as humor and humility . . . I could learn a lot from such an inspiring woman. She makes such beautiful crafts! And she encourages me in my projects, too. I could run next door and get recipes, good advice, and encouragement any time I needed it if this lovely blogger lived next door. She cracks me up!!! And I get so many ideas for fun activities to do with my kids. Who needs Pinterest with this blogger around? She is always there to encourage me by her comments on my blog . . . she lives 3,000 miles away and I feel like we have been neighbors for a long time. I would love to have coffee with her and chat! Please pick up your button above to display on your blog (if you wish) or pass along (if you wish). Nothing else is required . . . I just want you to know that you’ve made a big impression on someone (or many someones!) and that we’re all grateful you’re taking time out of your busy days to share your life with us. And I hope all readers will check out any blogs that you’re not already following . . . you just might make a new friend! And before I forget . . . the blog with the MOST nominations was Cobwebs, Cupcakes & Crayons! Click here to read about your prize, Kelly, and if you choose to accept it, please email me and I’ll send you my mailing address to get the ball rolling. CONGRATULATIONS! 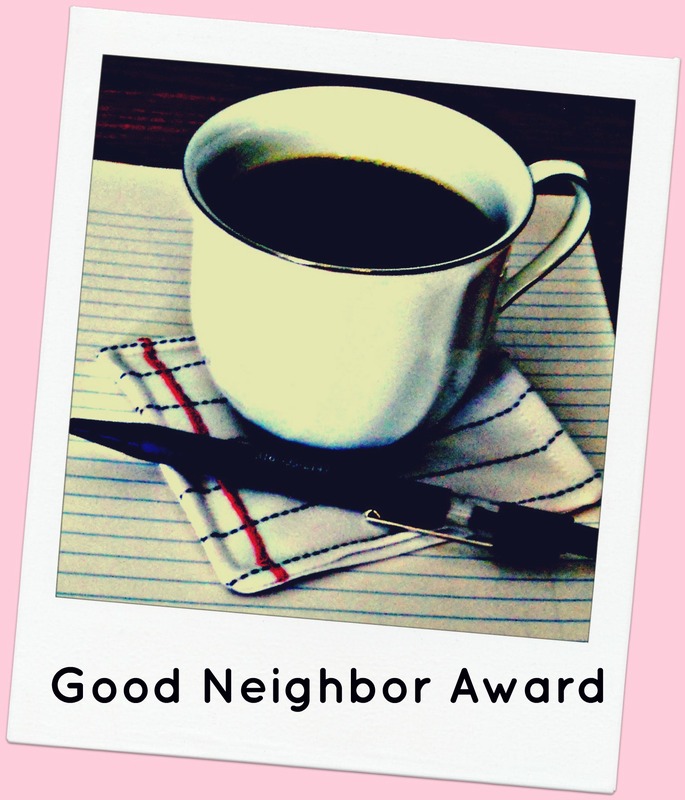 The GOOD NEIGHBOR AWARDS (in alphabetical order) go to . . . I love that you included the comments you received, it shows how much the bloggers out there are appreciated by the people who are visiting them. It’s going to take me a while to check out the other bloggers listed here. What a great gift you gave to everyone. Thank you, I was so surprised to see my name there as well. I am so incredibly touched by this award. I know that I have been inspired by all the bloggers I nominated and that I get excited every time I see a new post from them in my reader. I loved reading all the comments that people wrote about one another. I can’t wait to visit all the blogs on this list that I don’t yet follow. Thank you, Katherine for creating such a lovely award. And…YES! I accept!!!! This is the sweetest thing ever! Whoever nominated me, I owe you a beer and cupcakes (but we all know that’s a 50/50 chance of the cupcakes actually turning out). Congrats Kelly! And hang on, how can we get YOUR name on that list? hmm? Inspiring projects? Check! Loyal blogger who cares are about other bloggers? Check! Shall I go on? There’s a reason you’ve got all those great awards. You need this one too! Can I nominate you? There I just did. Now if you’ll excuse me I have a lot clicking to do on links. Seconding, thirding, and fourthing Alex’s nomination! I got warm fuzzies reading through all the comments! and then a nice little surprise to see I made the list! I am looking forward to checking out at least a few of the other blogs! Thank you! I’m a bit behind in reading this week, so I’m going back to ready our previous post. Wow, thank you for the nomination! This was just the most heartwarming post. All of you ladies are so talented. Thanks for hosting Katherine and congrats Kelly! You’re so deserving of this award! Can’t wait to check out some of these new blogs! I was reading through all the nice things people were saying and thinking how sweet that some people are loved so much and nearly fell off my chair when I was listed! Thank you so much to whoever nominated me! You are too kind! I’m so looking forward to seeing what you come up with! I know it’s going to be awesome. What a LOVELY surprise this Saturday morning! And it was so inspiring to read all of those comments. I’m so incredibly honored to be among the nominees…it took me aback a bit to see my name on that list after reading those comments. That kind of encouragement will certainly keep a girl motivated. And this award was such a generous idea. Congratulations to Kelly! Really?? I didn’t even *see* my name up there until you pointed it out to me! Thank you, Friendly Blogger who nominated me! And thank *you*, Katherine, for organizing this! I’m going back up to second, third, and fourth Alex @ North of Seven for nominating you. I am so grateful for your support! Okay, I’m turning off the exclamation marks now. WOW!! I just can’t believe this!! I am so humbled! Thank you SOOOOO MUCH!!!! I’m so happy you did this – I’m only partway through the list and have already discovered some great, new-to-me blogs to follow. I’ll be back to have more of a look. Wheee. What a nice surprise. Thanks. I can’t wait to visit all the wonderful people on the Good Neighbor list. I was amazed I was on there too. God bless you all. I didn’t win it . . . all of you did! You were nominated by your peers . . . but I would have nominated you, too, if I weren’t the moderator! 🙂 Congratulations! Wow oh wow oh wow….how beautiful, thoughtful and inspiring. It is so amazing that in this day and age where people get joy from bearing down and berating others there are people who love you for just you. I am so blessed to be surrounded both physically and virtually by true Angels here on earth. May God/Allah continue to bless you now and always my friend! OMG! I can’t tell you how totally thrilled I was to see that I had been nominated for this very dear and special award. Honestly, I was shocked and honored beyond belief. Warmest thanks to the person who nominated me, and congratulations to all who made the list! And heartfelt thanks to you, Katherine, for taking the time to moderate this award and for showing everyone what a true “good neighbor” really is. What a lovely surprise…I haven’t checked my reader for days as I’m in the process of moving house, so this was a lovely little discovery! Thank you Katherine for organising this. I love the idea of this Kathy…what a great turn-out! Yea for Kelly!!!!! So excited for her. It’s a great blog. I can’t wait to read all of the others! Thanks for doing this. The great response shows how appreciative everyone is of this community. Thanks! Wow! This is beautiful! Thank you for organizing such a great award! And thank you for the person who nominated me!! 🙂 I love this idea!!!! Thank you! And thank you to whoever nominated me! This is a really cool award. What a lovely way to celebrate your anniversary–you are the epitome of a good neighbor!! WOW!! Where was I when this was happening??? And goodness someone Nominated me??? I need to catch up with this more!! Thank you to whoever your are for nominating me and my Blog and to you Pillows for doing this.